The St Ann’s Hospice accumulator challenge still has over a week to go and there is still plenty of time to get involved and dig deep for an amazing cause! This October teams were given £100 each to turn into as much as possible over a month in aid of St Ann’s Hospice. 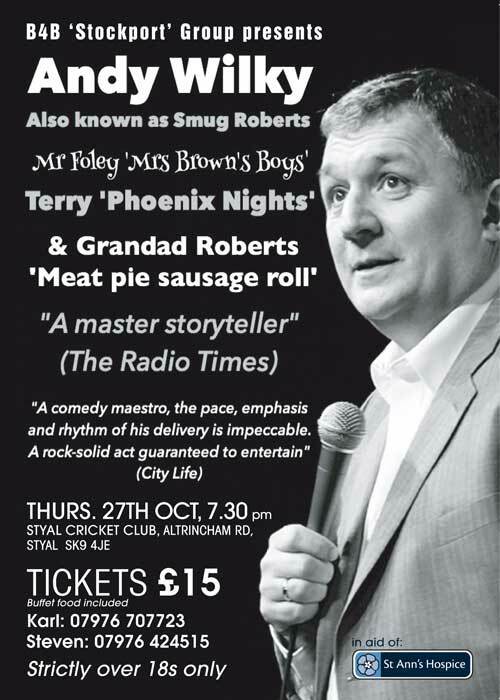 On Thursday 27th October, 7.30pm there will be a Comedy Night held in aid of St Ann’s Hospice. The night will include live entertainment from Andy Wilkey “A comedy maestro, the pace, emphasis and rhythm of his delivery is impeccable. A rock-solid act guaranteed to entertain” – City Life. Tickets are selling fast! Secure yours now to avoid disappointment, contact me on sg@stevenglicher.co.uk or 0161 485 8007 if you would like to come along. At Steven Glicher and Co Chartered Accountants we prepared our very own Football Charity Challenge requesting for you to commit a sum of money for every goal that Manchester United score in October and that Manchester City concede in the October fixtures. So far there have been 12 goals scored and conceded in October. It has been a great week this week for the Hospice as City conceded 4 and United scored 4! It’s not too late to join the challenge. Find out more information here: http://www.stevenglicher.co.uk/uncategorized/football-charity-challenge/.